Once upon a time there was a pirate. His name was Captain John Longfellow. He was good at plundering for treasure, and sailing the high seas. However, he was missing something in his life. It was a desire that could not be filled with wealth or gold. Some say the old sea-dog wanted to find a maiden to keep him company. Yet, his work always seemed to get in the way. Being a Captain of a fledgling ship requires much time and energy. One day a beautiful pirate vixen came along. They fell madly in love with each other. It was all a ploy, she made him walk the plank after stealing all his gold. Some say that is what made him change his ways. Others say it drove him mad. Captain knows he must show off his best asset to find a new love, one who won't steal his treasures. 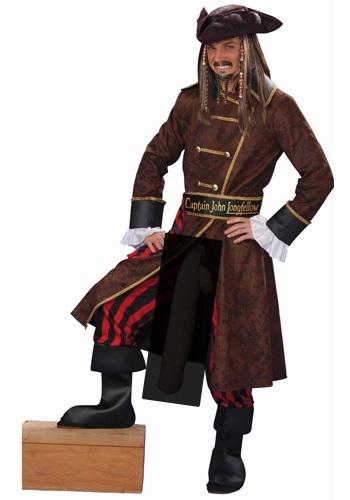 You can be just as risque with the Captain John Longfellow Costume. The costume comes with striped pants , a polyester brown jacket, and added details. The black belt has gold fringe and reads "Captain John Longfellow." A pirate style hat is included with the costume, as well as the very large flesh appendage. Just add a sword for swashbuckling and you will be ready for any party. Husband wore this, it was halarious and a fun night , we got some great pics and lots of laughs and comments on this costume.